I’ve been in the kitchen all day today preparing for the One of a Kind Christmas Craft-Bake -Business Fair, happening from 10:00-4:00 this Saturday in Arnprior at the Nick Smith Centre, 77 James St. On the docket for today was 2 batches of maple butter. Tomorrow I’ll change my focus to maple cones, then Thursday on to maple pies, and fudge on Friday. By the end of the week my house will be full of sweet smells of decadence, aromas of maple perfuming the air. This will be my first time attending the Arnprior craft fair. It’s a bit further from home, yet still local and I’m still hopeful to see some familiar faces. My hopes are that branching out to the Arnprior fair will help in distinguishing Julia’s Tree Stand Maple Syrup as a local, high quality maple syrup brand. If you’re an Arnprior local, come find me at the fair! For more info, click here. Hope to see you there! 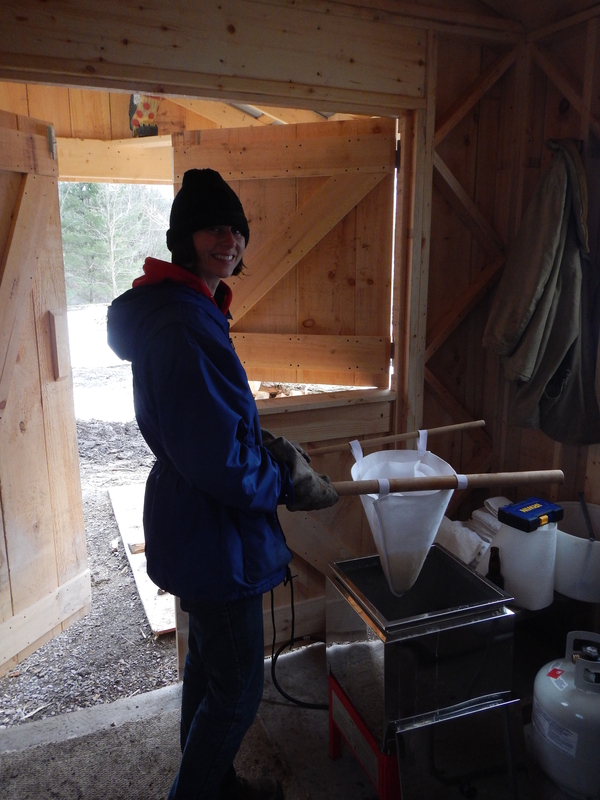 Today is our final, last day of maple syrup production. I feel like I’ve been a broken record about that lately; I’ve said this is our final day for three days now. To elaborate, we can only finish so much syrup at a time in our finishing unit. Then we take that batch of syrup in to be bottled. All in all, it takes roughly 2.5-3 hours for us to finish a batch. We managed to get three done yesterday before calling it quits. We are finding the “bottleneck” in our process is the filtering stage; when it was cold out I could understand how the syrup would cool down too much to flow well through the filter, but we’re finding even in the warmer weather it’s still getting hung up and slowing us down. I will focus on brainstorming improvements in this area for next year. Getting back to my point, today is our final, last day. Whew! We are in the middle of our 3rd season now. With a lull in the weather and pretty slippery conditions outside I thought I’d write a little update. Slippery surfaces and below zero temperatures. Our family dog Molson couldn’t get much closer to the fire if he tried. A couple of weeks ago the forecast had me worried that it would be a very short season indeed, however such predictions have thankfully proven untrue. I was given the great opportunity to feature my maple syrup at the Kinburn Easter Pancake Breakfast on March 19. On top of that I held my own pancake breakfast for friends of mine on site. What successes these events were! In Kinburn I received compliments on the delicious flavor of the syrup and an appreciation in keeping with the traditional bucket collection of the practice. Karen McCrimmon, our local MP stopped by as well, whom I had my picture taken with by a local reporter for the West Carleton Review. We had a very good run of sap earlier in the week. In fact, we hit capacity in terms of holding tank storage one day. As a result, AJ and I had a full day of boiling. Normally we start boiling in the late afternoon, after the temperature has warmed up for the sap to flow, and we’ve collected enough by the late afternoon to warrant it. Not Wednesday though. Wednesday we started boiling early in the day, kept the roaring fire hot with dry wood and managed to boil off over 500L of sap in our continuous flow evaporator. We drew off 3 times which, for those of you who are wondering is A LOT! Since we wanted to process as much sap as possible before it froze in the holding tank the next day, we set the drawn off syrup aside to be finished the next day and kept stoking the fire. The syrup that we drew off was practically done, very little need for time in the finishing unit. That batch was 27.5L; the clarity of that batch, and all the batches so far is excellent too. I’ll update more later. Right now it’s time to get back to work. I’ve been getting all of my ducks in a row these past few weeks. Since we tapped the trees 2 weeks ago, I have been stacking wood, cleaning tools, organizing equipment…and waiting for the sap to flow. And waiting some more. Since that week of sunny days with above average highs, the temperatures have dropped again (and I dare say plummeted last night to -15° Celsius with a wind-chill of -25°Celcius). Needless to say I’m antsy; I want to have a boiling day! I’ve been keeping myself occupied by double-checking that all of our equipment is in order, and doing beekeeping research (a story for another day). In particular we’ve been fine-tuning our sap-transportation process. Since the RTV has mini-caterpillar tracks on it meant for getting around in the bush now, it’s inefficient to be driving it back and forth to the house to empty the 50 gallon collecting tank out. I purchased a bigger tank (over twice the size at 125 gal) this winter that we will situate in the truck bed instead. So we will be dumping the buckets into the RTV tank, pumping sap from the RTV tank to the one in the truck, driving the truck to the sugar shack and then pumping the sap from the truck tank to the holding tank outside the sugar shack. We mulled over the best way to do this given the equipment that we already own and settled on purchasing an additional pump to leave in the second collecting tank for the season. Getting the proper sized fittings and tubing and quick connects has been a trial. At Canadian Tire and then at Home Depot we went in search for the correctly sized brass fittings – no dice. They had male 1/2 inch converter for garden hose, and a female 3/4 inch for vinyl tubing. Plastic and pvc but not brass. I reined in my compulsion to pull my hair out in frustration. The only purchase that resulted from that excursion was garden seeds for pretty flowers. We finally accepted that the most reasonable and economical solution is to duplicate the system that we already have instead of buying additional converters to fit the extra tube that we have lying around. Meaning, we simply need to buy more tubing with the right inner diameter. Big sigh. Wistful thoughts of mine include hanging my shingle beside this door and selling maple syrup straight from the sugar shack. With my second maple syrup season approaching quickly, thoughts of the sugar bush have been consuming my mind: sustainable woodlot practices, food preparation, equipment preparation… The list goes on. I’ve been tinkering with the idea of selling some of my maple syrup. In designing the sugar shack we included a set of Dutch doors on one side of the entry way. For me these doors bring to mind visions of old bakeries and other food producing kitchens where consumers could approach a kitchen and purchase food within minutes of it coming out of the oven. I value the notion of goods going straight from producer to consumer. Now, our operation is too remote (and muddy) to expect people to come knocking on our door looking for syrup, beyond a couple sales to friends at a pancake breakfast I plan on hosting but it’s still fun to include the Dutch doors design element into our sugar shack. Since we are located close to Carp, selling at the Carp Farmer’s Market is the next best thing to selling straight from the sugar shack. Here is my label design in all of it’s glory. For fun I designed a logo to put on my bottles. The design is a simple drawing; pencil, very flat style. Basic yet distinct. I chose these elements to convey the traditional, back to basics nature of our methods; and the unique flavors of pure maple syrup. (What’s more is unlike some commercial brands my syrup is made from 100% maple syrup and doesn’t contain a plethora of ingredients that you can’t pronounce!) Since I’ve got the design figured out, my next step is to find some label paper that I can print on and set up a printer template. I’m thinking that I want an arched top, however that may cut off a lot of my drawing. Maybe I should add some more tree limbs to the top…. Back to the drawing board!! As I’ve mentioned before this past maple syrup season held a big learning curve for us. We learned that we need to: hang ALL the buckets in one fell swoop, prepare for getting stuck in the mud, etc.. At the end of our maple syrup season this year one improvement needed that stood out was a more efficient way to filter the hot syrup. What we did this year was use two wooden poles to hang the felt filter from that someone had to hold aloft for the syrup to strain through while it was being poured from the evaporator. I don’t know how many of you have made maple syrup before but these filters are thick, and having thick maple syrup being poured through a thick felt filter takes a long time. To save someone from having to stand there using both hands to balance poles on the side of the evaporator (or above the finishing unit) I’m having a filter stand/mount made. Not nearly as complex as it sounds it is simply a metal frame with two feet and two arms that will easily hold the weight of the syrup being strained. Next year we will use a more efficient method than this to filter the sap. The two human hands freed up in place of two metal feet and arms will prove invaluable for when the pan needs to be flooded because the syrup level is getting to low, or the fire needs to be stoked because the temperature is hovering just below where it needs to be, or even for when the foam is building too high and needs to be skimmed off in order for it not to boil over (which I’ve heard can be quite the mess to clean up but luckily have not experienced yet). Bit by bit we will amend our process. Our maple syrup season has come to a close. What a rush this season has been though! From start to finish this season has kept me busy fulfilling some responsibility or another. 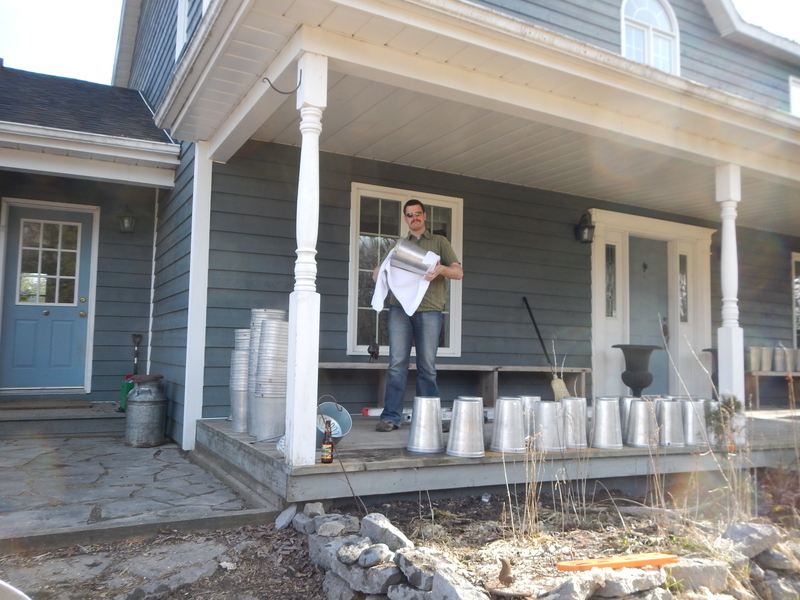 We had a busy Saturday April 12 boiling the last draw, then I made the decision Sunday April 13 to pull the taps. When we got out to the bush my decision was confirmed by what I viewed in the first couple of buckets; just enough sap to cover the bottom of the bucket, not enough to justify another boil though. Moreover, my decision to pull the taps Sunday instead of Monday was further validated by the steady downpour of rain Monday brought. So I finished my final batch Monday, then tallied up our syrup production for this year. Our total yield for 2014 is a whopping 70 Litres of syrup! Now I have 150 each of buckets, spiles and lids to wash; the evaporator to scrub out; the finishing unit to scrub out; bottling equipment to clean; the collecting tank, the boiling instruments, the filters, the holding tank; all of this equipment needs to be cleaned before storing them for next year. This year was a whirl-wind adventure and, while the learning curve was steep I’ve gleaned several important points for next season, including that if I try and drive across the field when it’s muddy after the thaw I will get stuck and need my neighbor to help push me out. I’m excited for next year. I have my eye set on a workshop or two in the coming months, that teach about maple syrup production to hobbyists, and forest management. For now though, I’m content with finishing cleaning up and catching up on some well-needed rest. It has been a unique season, I’ll say that much. An uncharacteristically cold March, followed by what seemed to me to be a rapid spike in temperatures has not boded well for the maple syrup season here in Eastern Ontario. With the temperature warming up so quickly, the significant snowfall we have experienced this year is now melting, quickly! Left in the snow’s wake is mud. Tons of mud! Enough mud to make sap collection with a motorized vehicle not possible without getting stuck in the mud. Back to basics for us! Armed with an 8-gallon milk jug, two collecting pails, a sled to transport everything and the will-power of true Canadians we set out to collect as much sap as our milk jug would let us. We headed for the furthest trees first and worked our way forward from there. Hauling everything there was more than half the battle – we dealt with steep inclines, a tippy sled and lots of sticky mud! We filled our jug from 30 buckets… only 110 buckets to go! Time to trek back to the house. At the risk of losing our sap, we opted to travel a different route back, a route with less tipping hazards. We pulled the sled across the pasture instead of in front of the treeline. At the ridge we carefully guided the jug of sap down the path to the front field, checking the ridge-buckets along way. They were over half full and needed emptying too. We had to go back to the house to get the 50 gallon holding tank and UTV, not merely an 8-gallon milk jug to collect all this sap. Off we went, across the snowy field, taking turns pulling the sled or holding the jug upright while pushing the sled. Whose crazy ‘let’s make maple syrup’ idea was this anyways? I sheepishly grin and avert my gaze. 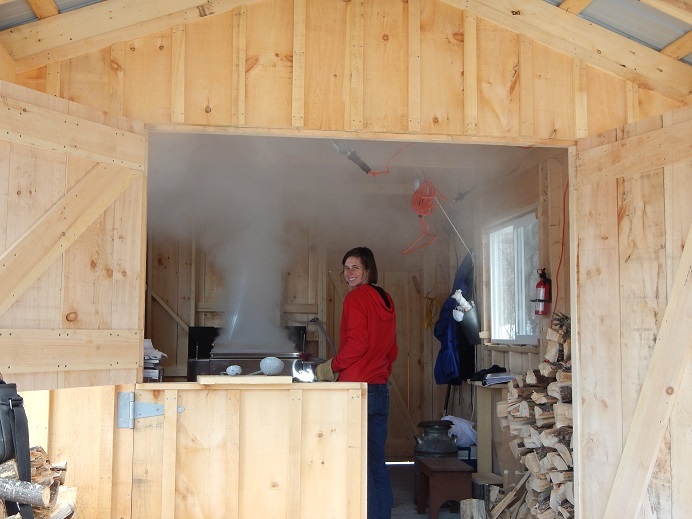 Big days in maple syrup production are the boiling days. I should preface that statement, noting that ALL days in maple syrup production are big days from the many labor-intensive duties the process requires (fuel needs to be collected, the trees need to be tapped, the sap needs to be continually collected, the equipment needs to be sterilized), but I deter. The BIGGER days in maple syrup production are boiling days. As can be deduced from what is described below, it takes a lot of preparation! Boiling days typically last from 8am to 3pm or later. On boiling days, one needs enough firewood to feed the fire in the evaporator approximately once every two minutes. For a full day of boiling that requires a lot of wood. To know roughly how much wood we will require let’s do bit of calculation: now, a cord of wood is defined as 12 inch pieces of wood piled 4 feet deep, by 4 feet high, by 8 feet long. Maple syrupers say that when using dry, split hardwood, evaporator efficiency is about 25 gallons of syrup per cord; 15 gallons of syrup per cord with dry, split softwood. We’re using some soft and some hardwood so I’ll average it out and say 20 gallons/cord. We have bout 125 taps up that will each produce on average 20 gallons of sap over the season. This will yield a grand total of 1875 gallons of sap (20 gal. x 125 trees = 2500 gal.). Divide that yield by 40 (40:1 sap:syrup ratio) and you get 62.5 gallons of syrup. Finally, divide 62.5 gallons by ~20 gallons per cord and you get 3.12 cords. All that is to say we will need a little more than 3 cords of wood this year. Now, all of these calculations are based on dry wood. This means before the boiling even takes place enough damaged trees need to be cut down and cut into logs which are then split, stacked, and dried. Drying wood takes more than a weekend, or even a month. Drying takes about a year of sun shining down on the wood, slowly evaporating moisture from the densely packed wood fibres. Making maple syrup is not for the faint of heart. It requires lots of work, including felling, cutting, splitting and stacking wood for fuel the following year. This year is going to be a bit unconventional for our maple syrup production. Since we just bought our evaporator this year, we don’t have that much stacked and dried fuel set aside specifically for burning in the evaporator. Luckily, we have some extra that hasn’t been used to heat the house this year that we can use for evaporator fuel. To be better prepared for next year my Dad and I have been in the bush a number of times lately, felling dead trees for fuel, cutting the wood into logs and splitting and stacking the wood to dry. On boiling day, dry fuel wood burns furiously. The chimney attached to the rear of the evaporator in the sugar shack rises high above the roof-line to catch the airflow of the wind. This airflow draws the flames from the firebox of the evaporator, stretching the flames from the ‘arch’ as maple syrupers say, toward the back of the evaporator to the chimney. Since the evaporator is so long and the fire is positioned near the front, the flames get stretched/drawn-out almost horizontally towards the chimney, to almost a metre in length at times (witnessing the power of the blaze once it gets going is awe-inducing and makes me very glad we mounted a fire extinguisher on the wall within an arms reach for if things were to go awry!). It is this draw from the chimney that heats the length of the flue pans that sit atop the firebox and increases the efficiency of an evaporator. If wet or green wood were to be used instead of dry wood, the crisp, roaring fire that makes an evaporator so efficient would be replaced by a smoldering, smoking mess. Smoldering wood does not create nearly enough heat to evaporate sap into syrup, hence all the fuel preparation maple syrup requires! Maple Sugarer: A person who taps maple trees to produce maple syrup and other maple flavored products. As the days get longer and the temperature warms one can tell spring is in the air. After a long winter of being cooped up indoors to escape the cold, many jump at the chance to enjoy the outdoors again in warmer temperatures. The tell-tale drippings of melting snow signify a lesser known event as well – the beginning of maple syrup season. When the temperature raises above freezing during the day and below freezing at night, sap that has been kept in safekeeping in trees’ roots starts flowing up and down the thick trunks of maple trees as Mother Nature prepares the forest for growth. Maple sap comes from tapping trees in the springtime during that flow, or run as maple sugarers call it. Traditionally, to tap a tree one drills into the trunk two inches and fills the hole with a spile or spout. A bucket is hung from a hook attached to the spile. This allows the maple sap to run out of the spile and fall into the bucket. Drip, plunk, drip, plunk, drip, plunk. The sound of the forest during maple syrup season has a calming quality to it. It is easy to be mesmerized by the sound. However, there is little time for that since the run happens for such a short time of the year. Whomever coined the sap flow a ‘run’ knew what they were talking about – for about 6 weeks sugarers are running around the forest in a frenzy tapping, collecting sap once, maybe twice a day and then spending a full day boiling down the sap in a sugar shack every few days until it reaches just the right density to make syrup. Evaporators are used often to boil down maple syrup. Evaporators are specially made units to increase a fire’s heat efficiency, in this case to make maple syrup. They can range anywhere from 2 to 12 feet long, depending on the size of one’s operation. Evaporators have an arch, where the fire is started and the wood is loaded in to feed the fire. On top of the arch are a set of pans. These pans have flues in them, little raised inlets which increase the surface area of the pan and this is where the increased efficiency comes from – the more surface area of the pan, the faster the sap evaporates. On boiling days steam rises off the pans in clouds and comes billowing out vents at the top of sugar shacks like clouds of maple-flavored cotton candy! When the boiling is done everyone breathes a big sigh of relief! Until it needs to be done again, that is. The run is a busy time indeed!